"Once upon a time, paintings came up to me in a dream, paintings that I wanted to paint: the ones imbued with light", Anna Podlewska tells us her story. I remembered that dream, although I cannot remember what they looked like. One thing was for sure, though: in my dream, a painting appeared that was being built not with a form, or texture, but with light. The artist says she paints 'childishly easy' pictures, being reduced to the Elementary. To not-quite-penetrating a viewer, it might seem that the eye, whilst sliding over those ideally plain canvasses, cannot find anything really intriguing and fast gets to sensing but piercing boredom. But only apparently can those works be deemed uniform monochromatic units, maximally reduced portraits of 'emptiness', in which nothing is really happening. In essence, this is an ideal example of an extremely vivid painting art, placing a bet on the quality of matter. It stimulates your senses strongly indeed. And, renders ideally the passion for creation. In the artist's opinion, it is Light that matters most. The form is a secondary factor. How, then, does the painting matter absorb light? How does it reflect it, and give back to the viewer? The skill of catching glitters, glares and reflections of lights within pigment spots has for ages been worrying artists. To tell stories on light using colours and paint textures has been a daydream of all great artists. Artists have always believed in emanative nature of light. Podlewska fears mortal emptiness and the moment in which a painting work still remains 'dead'. She is a master of synthesis, but is afraid of the rigorism of a typical 'minimal art'. She would willingly talk of the phenomenon of 'transportation', that is, transporting, or transferring, of light. In a painting, something must be taking place; it cannot possibly remain neutral. It must emanate, involve the sight - as with one of paintings by Wojciech Fangor, who, by painting his flickering colour spots, attracted and absorbed the viewing person's eye until a complete weariness. How does the artist, then, visualise the nature of light? Resulting from her intuitive search, she managed to work out her own unique technique. She places even up to thirty layers of paint on a canvass, so that the pigments 'migrate' upwards, producing specific, intuitively perceived light. 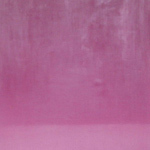 The painting's plane gains then a certain weight, wins a flush or glare, a flickering glow, and seems to be vibrating. The artist works until she can find a vividness, and pulsation, of matter. She would apply, one above the other, her favourite forms and motifs, painted with thin, transparent layers of paint, thus deepening the colouring of spots. She would delicately mat, or tarnish, them by adding some wax. The unusual brightness, as generic to glazes, is added to them by the way she paints - that is, adding the paint precisely, slowly, in a meditation-like manner, with horizontal touches of the brush. This painting method integrates the canvass whilst also being decisive as to unity of its composition. Thanks to a sublimation of the rich texture and the warm and cold, sophisticated shades, light, approached conventionally, emanates from the picture. The Invisible seems to be suggesting an internal tension. Although Podlewska perceives the world with colours, it would be rather unjust to name her a 'colourist'. She is not interested in an academic colourism, or in searching, with a balanced precision, for the best painting decisions possible. She does not attempt at explaining the physical phenomena, or sight illusions. Usually, she paints large-format oil paintings being ideally cleansed from any redundant details. She gives them sophisticated predominant colours, such as Indian rouge, various shades of white, turquoise or ice-cold blue, refreshing violet, or, an ocher that carries a blow of exotics. On selecting her colours, she would rely on her own intuition, or, observation of the surrounding environment. She reflects moods and spiritual states with colours. In her paintings, enchanted is an 'alphabet of feelings' of sorts; there is no tension, or aggression, in those brightened tones. She translates joy and fulfilment of maternal potential, and, the feelings of love, warmth, and tenderness, into the language of colours. According to Merleau-Ponty, painter, on his or her dealing with the 'raw being', has involved 'fleshiness', 'the flesh (pulp), the 'fleshy tissue' (French 'la chaire'). Imbued with light, Anna Podlewska's works provide the best possible illustration of 'fleshliness' of painting. They form a starting point for considerations of purely painting-related plane. Therefore, her paintings change, as she herself changes. Her sophistication and refinement as an artist have resulted from unusually consistent efforts. For Podlewska, a piece of painting should get 'well-seasoned', just like wine. Sometimes it would take her two years to produce one. And, she feels rather uncomfortable when she does not have enough time. She has to be given some time to take a closer look at the work, find a distance, and employ her intuition. When working on a painting, she takes breaks, moves the work aside, and then gets back to it, over and over again. She can entirely repaint a work. The staring point for those large compositions are sometimes some very personal drawings or watercolours, whose nature is ephemeral. Podlewska treat them as research study work, a sort of painter's notes. They are full of lines, geometric shapes and loose organic forms which have been 'borne in the mind' for long. The artist composes entirely new arrangements with them. Usually, she would start from a module, which most frequently takes the form of a rectangular format of a painting. She appreciates the play of geometry, and therefore she divides the surface of her canvasses and fills it with abstract forms. Some very well known objects and shapes give the painter a sense of safety. She simplifies and geometrises the forms taken out of the world of nature. From the landscape, she transposes the vertical line of horizon that divides the sky and the earth. In a mildly running curve, one can see an outline of a hill. Thanks to their harmony, the paintings seem to harmonise with, and penetrate into, the landscape. A painting's surface can find its continuum in an authentic space. No wonder, that: some time ago, she showed her paintings, as part of a students' exhibition in Switzerland, amidst Alpine meadows. Nowadays, she spends a lot of time in a sitting room of her little house in a Warsaw suburb, with its large windows opening toward a birch wood. However, in her works, this painter is not willing to tell stories. She does not even furnish them with titles, so that the viewer may be left with a freedom of how to interpret them. The artist usually operates with an ideally soft texture. An exception to this rule is a couple of white paintings. Their uniformly white, monochromatic surfaces form strips of paint, applied with flat touches of the brush, which then neighbour on each other. Accumulated layers of paint may be spotted only when a painting's surface is viewed at quite an acute angle. 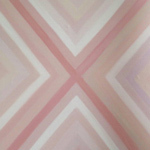 Out of the subtle relief of the painting matter, geometric forms slowly emerge. Are these but forms, or also, some symbols? There is something magical to it; painting being, after all, magic. "Some time ago, I used to paint pictures being full of symbols and signs. Those crosses is a remnant of them', Podlewska says. The late Tadeusz Koper, author of abstract sculptures, whose studio at Carrara I visited during my tour in Italy, showed her a simplest piece of marble, with a circular hole cut in it. He deemed that simple object to be one of his most personal sculptures. He was of opinion that each human being has to have his or her own circle. Or, square. Although so many individuals have painted or cut out those figures, one has to search for and find them on their own. There is no single universal form being reserved for each artist. 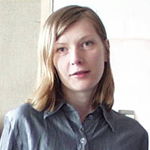 Anna Podlewska gives geometric rhythm a symbolic rank. Divisions and marks whose nature is archaic, when introduced into a painting, give a direction to the painted plane, and a rhythm as well. They build internal tensions. She paints crosses, straight and slanting, with strands of paint representing a delicate rainbow of shades, ranging from rouge to white. Like an archetypal pre-painting, this colouring range shows off an energetic value. Anna Podlewska values high several masters of light. However, she has not ceased to look for her own way, so that she does not copycat anyone else. She gets bewitched with Velazquez's paintings. She values Pierre Soulages really high. She loves paintings of Balthus who makes a perfect use of some unusually elaborated fragments. 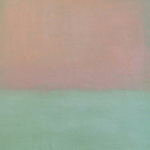 Finally, she finds the American abstract painter Mark Rothko close to her; in his paintings, with their excellently harmonised colours and resonant chords, he managed to create a most perfect examples of 'painting of matter'. In his art, he constituted a new world that usually remains not perceived. He has resorted to a double record. He was tracing the phenomenon of presence hidden in a colour spot. He would reproduce the composition of selected archetypes, e.g., Pietas and Crucifixions. In the works of his titled Number 18 1948 or Number 1 1949, some commentators sought for a repeated The Adoration of the Magi by Quentin Massys of 1526. (*) Quoted after: ;4 x Paryż / Paris en quatre temps , the Exhibition Catalogue, Zachęta Art Exhibitions Office, Warsaw, 15 October 1986 - 12 January 1987, p. 152. 1. M. Merleau-Ponty, The Eye and the Mind , translated into Polish as Oko i umysł , in: M. Merleau-Ponty, Oko i umysł. Szkice o malarstwie [ The Eye and the Mind. Essays on Painting ], selected and edited, and with a Foreword by, Wybrał, Stanisław Cichowicz, Słowo/Obraz Terytoria publishers, Gdańsk 1996, p. 22. 2. V. Kandinsky, On Spirituality in Art , translated into Polish as O duchowości w sztuce , translated by Stanisław Fijałkowski, with an Introduction by Max Bill, ed. by State Art Gallery in Łódź, 1996, p. 68. 3. M. Merleau-Ponty, therein, p. 67.